In the 1930s and '40s, tourists traveling to Cuba brought a steamy new step back to the dance floors of New York City. ​At the Palladium Ballroom, the Mambo became a sensation and the hot-blooded music soon swept the nation. Dancers were dazzled by the Latin big bands of Tito Puente, Machito and Tito Rodriguez, and mambo dancing was a pervasive aspect of post-World War II social life. Surprisingly, many of the mambo's biggest fanatics were Jewish. They were a merry band of devotees whose zeal for dancing earned them a hipster nickname: The Mamboniks. This is the joyous story of their wild ride. From the Tropicana Club in Havana where they discovered the music, to the Art Deco hotels of Miami Beach where it gained a toehold. 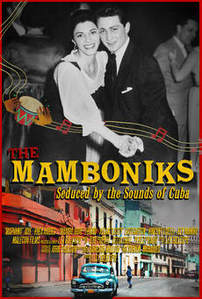 From the Jewish resorts of the Catskill Mountains and Manhattan's famed Palladium Ballroom, to Miami's Gold Coast Ballroom where the old hoofers still dance, this feature film charts the irrepressible and tender lives of the Mamboniks, set to an infectious soundtrack, super-charged dance scenes and vintage mid-century clips. Musicians, club owners, disc jockeys, record company moguls and dancers (now in their 80's and 90's and still dancing!) reunite to tell this intimate tale, sharing thoughts about the beguiling music, love, friendship, adventure, coming-of-age, Jewish identity and the meaning of a life well-lived. "It appealed to the Jewish soul." “Back then, ninety percent of my audience was Jewish. Paulson Productions is Executive Producer and Creative Consultant. Tune into Westchester Eye on the Radio tomorrow, March 12, 2019 from 3-4pm for an interview with the director, Lex Gillespie. WVOX 1460AM. Also streamed live online at wvox.com.